i have to say: one of the very reasons that i became interested in cheese tasting at all was humboldt fog. i think this cheese is truly outstanding. even after months of regular tasting this cheese is still elusive and completely enjoyable to me. the ash down the middle is actually vegetable ash, ricky, which also plays a role in the rind. i tasted along with provolone ranger and assorted other folks. 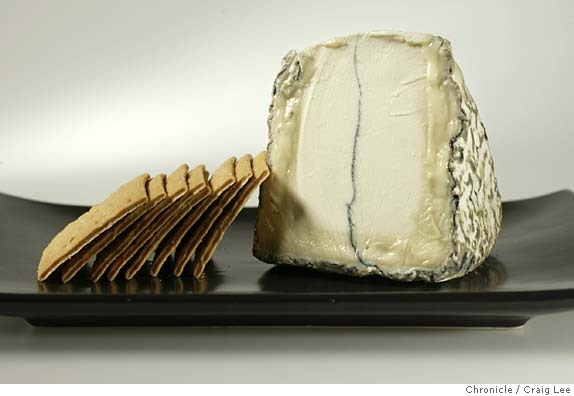 we stuck to chardonnay, humboldt fog, and the cyprus grove chevre. and the humboldt fog was tremendous as usual. such a myriad of flavors and textures: continually changing as you taste. i think if any cheese reminds me of wine it would be this one. i have other news to report: we may be bringing on some new members as soon as they resolve their cheese names. more later! gouds- your combinations of cheese with 'other' are always amazing. you should write an book that is based solely on pairings...your parmigianno w/ apple (i bleieve) was your last hit. I will remember chardonnay w/ humboldt fog, although my guess is something dry, like a pinot gris grape might be just as nice. then you have a sort of dry finish with a full cheese. so, anyway, im glad you also tried the chevre-- interesting that it was sour - i'll look for it next time i am at the store. Hmmmm. So I was the late guest that caused the chevre to be sour, huh? Well, I agree with goudacris that the Humboldt Fog was the bomb. We actually had it together once before at a San Diego establishment, and I really enjoyed it. It's a very accessible cheese-- good texture and tasty. Good for a novice like me and the other guests who shall remain unnamed. first off, it's good to be here. thanks to gouda for the invite and thanks to all you fromageophiles for letting me in on the fun. i purchased myself a nice wedgelet of hf from my local overpriced but charming "gourmet grocery". as i am in san francisco, i selected a fine sourdough baguette as an accompaniment. i followed a hot tip from gouda and decided to sample this cheese with a crisp, refreshing white wine (i opted for pinot grigio) and some pears. i took my fog home and gave it a quick visual inspection. i have to say the rind is pretty badass looking. i, too, was intrigued (and slightly disconcerted) by the blue moldylooking line running down the center of the cheese… and most pleased to learn that it is merely vegetable ash. although this does beg the question: what exactly is vegetable ash and what is it doing in my cheese? in any case, the fog looked good. it smelled good. i sampled it first with baguette. then with pear. both times with wine. mmmm. smooth. light. delectable. a bit powdery, perhaps, which in my opinion is a very good thing. apparently, many people consider the darker outer portion, or "shell", to be the best part of this cheese. as i am automatically wary of "many people" and the things they like, i was prepared to hate it. but i must admit this yellowish, slightly runny-looking portion of the cheese was simply divine. just enough tart und tang blended perfectly with the smooth fogginess that is the middle portion. i pity the cheese that has to follow an act as tough as humboldt. in short (not really), i like this cheese. i like it very much. Welcome chedda. That is pretty interesting about the outer, yellowish shell tasted good and is oft-talked about...I will try to pay attention next time. Indeed, Gouda should take up a permanent, side-job position in this project as consultant for fromage pairings-- he always has great selections many of which he stumbles on using some intuition and some luck, I imagine. As for why? I couldn't find it online. I think it's purely for stand-out quality. Ciao, for now..
Few words can describe the pleasure of sitting in a dimly-lit living room -- jazz cooly lingering from the record player in the corner -- mixing cheese and wine with none other than Goudacris himself. An honor, indeed. Contrary to the popular vote, I must contest HF's lofty status. While it is a delicious cheese that goes down smooth, I find the taste a bit too mild. I agree it has s fuller taste than your average chevre, but is it noticeably different from the "average" served on an herb slab? It is a great cheese worth picking up for an evening snack, but it might not be worth writing home about.